There’s Michael Jackson. And his sister, Janet Jackson. There’s Samuel L. Jackson, the everywhere actor. In sports, we had Bo Jackson and Shoeless Joe Jackson. You’ve probably familiar with at least one of these stars. But are you familiar with Jackson, Michigan? Founded in 1829, the city took off around 1905 creating auto parts and fashioning them together to make cars. Thanks to its railroad station, it was a hotbed of numerous other industries, including the corset industry. Jackson was the home of the first corset company operating anywhere outside New York City. Zoom forward to the 1960s, and the city, like many manufacturing spots around the country, began a slow decline. 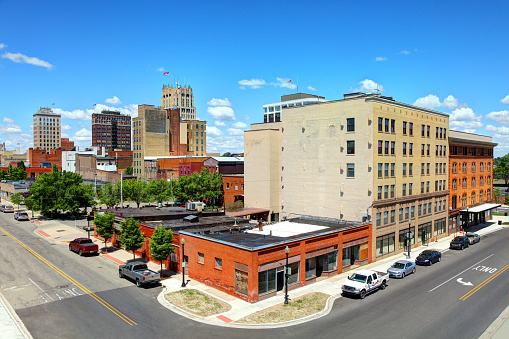 But like many cities that experienced the manufacturing downturn, Jackson has worked to turn itself into a place where residents can easily live, work, and play. With an influx of breweries, wineries, and restaurants (including a BBQ spot voted the best in the state), food-lovers will delight in their choices. Like speed? The state’s largest NASCAR venue is just down the road, and nearby Grass Lake hosts annual powerboat races. Jackson has also not shied away from its prison-heavy past but has opted to embrace its history by giving tours of the original “largest prison in the world” and opening a museum inside a once-active penitentiary. Of course, to enjoy what Jackson offers, it helps to live here. And if price is a key factor in your decision, Jackson’s got you covered. A 4-bedroom recently-renovated home for less than $200,000? Available. Classic, turn-of-the-century architecture for less than $100,000? Yep, that’s here too. With its long history, there are old homes here, and many are ripe for renovation. If you want something more modern, new construction dots the landscape. And if you’re living here, you might have children to send to school. They’ll be Jackson Vikings and will attend one of seven elementary schools before moving onto the sole middle school and one high school. The high school offers more AP courses than any other Jackson County school, and there’s a partnership with the Jackson Area Career Center for career path training. On the weekends, go outside! Miles of hiking/biking trails and acres of luscious forests stretch from the city center. Like golf? Jackson has the highest number of golf courses per capita in Michigan and second-highest in the country (Jackson will catch Sarasota, FL soon). Or stay close to home and play basketball in one of the city’s 26 parks. Jackson would love to have you. While Shoeless Joe won’t be here, it was good enough for James Earl Jones (who lived here until he was five years old) and Pro Football Hall of Famer Tony Dungy (who grew up in Jackson and played football at Parkside High). Give the city a look; you won’t be sorry! ©2019 MaxBroock. All rights reserved.